Ever wondered what it would feel like to make art history? 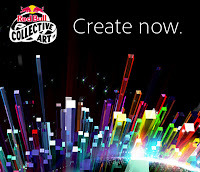 Adobe and Red Bull have announced an exciting new collective project that will make art history. So want to take part ! This exciting new collective art project will give creative talent from across the globe - everyone from designers and artists to photographers and publicists - the chance to take part in creating the biggest and most original piece of artwork the world has ever seen. Make Sure You Stay Updated by -Subscribing to Our Free Email Updates !! Together with Red Bull and Adobe are inviting budding artists from 85 countries to take part in Red Bull Collective Art, a project which will layer multiple pieces of art created by different designers to make one collective piece. Each contributor has one hour to put their artistic stamp on the final piece of artwork, which will be exhibited in art galleries across the world from May. Taking place between 11th and 24th March, you can register online to choose your one-hour slot. Once registered, you'll also receive a free copy of Adobe Creative Cloud to help create your contribution. The artwork will then be exhibited across the world from 13th May. So what are you waiting for? Become part of art history today by registering here.